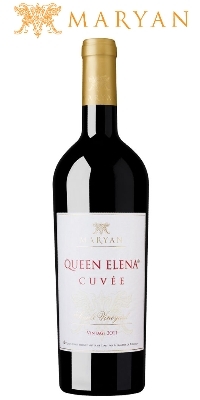 History of the brand: Queen Elena is Tsar Ivan Alexander’s favourite sister. She becomes the Queen of Serbia after a dynastic marriage to King Ivan Dushan. She plays a major role in the Bulgarian relations with Serbia and Byzantium. A blend of Merlot & Cabernet Sauvignon & Cabernet Franc fermented and matured in oak casks for 9 months. Colour: The colour is intense dark garnet with ruby hues. Aroma: Noble complex aroma with hints of ripe black cherry, blackberry, plum, mocha with vanilla, transforming into piquant notes of green pepper and roasted red pepper. Taste: Fresh, juicy perfectly rounded body with great balance and finesse. The wine is ready for drinking but could mature for a further 5-8 years. Pair with game, veal and beef, rich cheese.